It is possible to print max 20x20x20 cm objects in Makerspace. 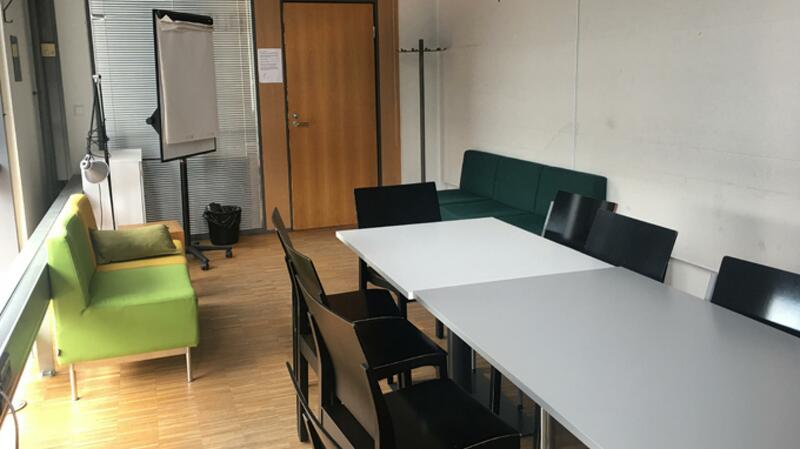 Please book time https://varaamo.espoo.fi/ from Makerspace or call tel. 09-816 57607. The Self-care point is on the second floor near the service desk of journals. There is a blood pressure cuff, a scale and information about how to take care of your health and well-being on a daily basis. The desktop computers are on the first floor, in the Music-Makerspace area, no need to book time. LAPTOPS: Borrow a laptop from a laptop kiosk on the second floor, to be used during your visit in the library. You need to have your library card, and a pin-code. Sign in to a customer computer: library. Password: 12345. You cannot print from laptops. In Sello Library there are 3 copy machines (colour). One is in the lounge, one is in Makerspace, one is on the second floor near the info desk. You may print up to 20 pages. Please avoid unnecessary printing. The default setting for printing is black and white. Prints and copies are free of charge. There is a data projector on the stage, Akseli Hall and Ilmari. 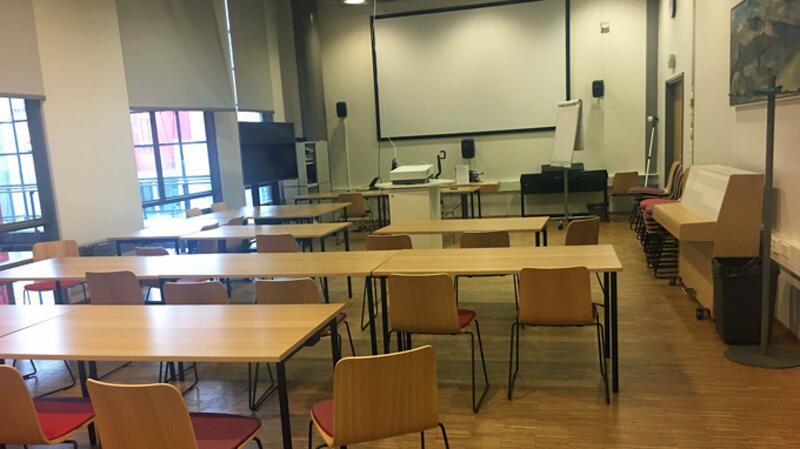 You can also book and borrow a data projector from Makerspace to be used in the facilities of Sello Library: tel. 09 816 57607. Desibel Meter. You can borrow a Desibel meter from the Makerspace for 2 weeks. You can borrow power consumption meters at Makerspace on the first floor. The loans are for 2 weeks, and it is not possible to renew the loan. Impact drill. Borrow one for 1 day from Makerspace. See the link if it is available! Cannot be renewed or reserved. There is a video- and photoediting computer iMac Adobe Creative Cloud 2014: Photoshop, Premiere Pro, InDesign, Illustrator, Dreamweaver) in the Makerspace. 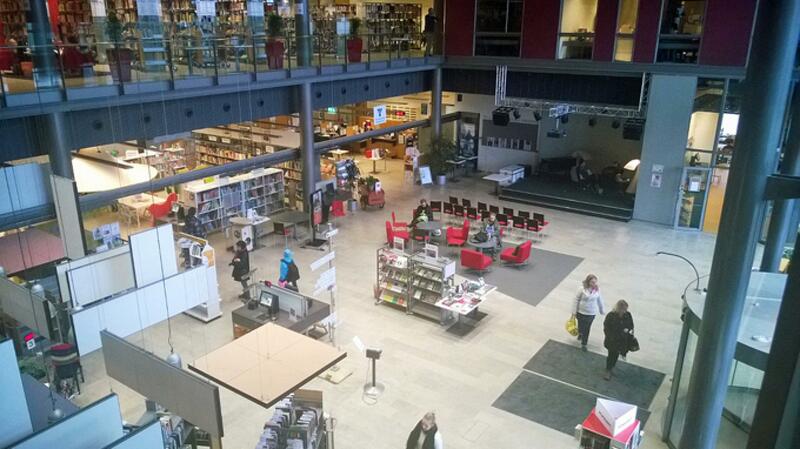 Please book a time online: https://varaamo.espoo.fi or from the Makerspace. Memory card reader. Device for reading SD, MMC- and Compact Flash memory cards. You can borrow a memory card reader from the Makerspace to be used inside the library. The color printers are on the first floor, in the Makerspace and at the service desk, 1st Floor. Soldering iron. Borrow one for 2 weeks from Makerspace! Cannot be renewed or reserved. Please check from helmet if it is available. Surface thermometer. Borrow one for 2 weeks from Makerspace! See the link if it is available! Cannot be renewed or reserved. There is a table football game in the youth section Pointti for over 12 year old customers. Borrow a tablet computer at info desk on the 2nd floor. Give your library card's last 4 digits. The tablets can be used only inside the library and for 2 hours. When you return the tablet, just place it back on the rack and all the information will be wiped out from the tablet. Waste tongs. Borrow waste tongs from the Makerspace! The loan period is 2 weeks. You can not reserve waste tongs. Self-care Point is situated on the 2nd floor near the periodicals' info-desk. There is a blood-pressure meter, a scale and information about health. Please see the link for more information. Biljard. In Pointti for customers over 12 years of age. Please book a time at Pointti. In the lounge and in Children's Land are the the board games that you can borrow. In Pointti and in the Children's Land you can play board games. Cafe "Kirjastokahvila Marian Konditoria" is partly inside the library, tel. 045 1485 775. There are several cafes in Sello. Also from Roberts Coffee, you can order catering for your event in the library, tel. 0108394003. Digitize photos, slides, negatives, cinefilms, LP's and c-cassettes and VHS's in Makerspace! You can get help how to use these devices in Makerspace and/or book them by calling 09 8165 7607 or you can also book time online https://varaamo.espoo.fi. More information on helmet.fi/sello -> Makerspace. LP-discs and c-cassettes into DVD or mp3. Self service, but you can get help from the Workshop's info desk. For more information please see Makerspace - page on helmet.fi/sello. Book online: https://varaamo.espoo.fi or call 09 816 57607. We wish to protect those with allergies In the Children’s department, and recommend keeping dogs off the carpets. Other than that, dogs are welcome to Sello Library. You can return library materials even if the library is not open. The Book drop is in the entrance C to the left from the main entrance. The Book drop is open: Mon-Fri 7.30-8.00 and 20-21 Sat 7.30-10 and Sun 10-11. The real returning date will be set when the library is open next time. It is on your own responsibility if you return your loans via the book drop. Baseball (Finnish) set for a team. You can borrow a Finnish baseball set for a team from the downstairs service desk. There are 2 sets you can borrow, one for a youth team or one for an adult team. Check availability HelMet. Sets cannot be reserved. 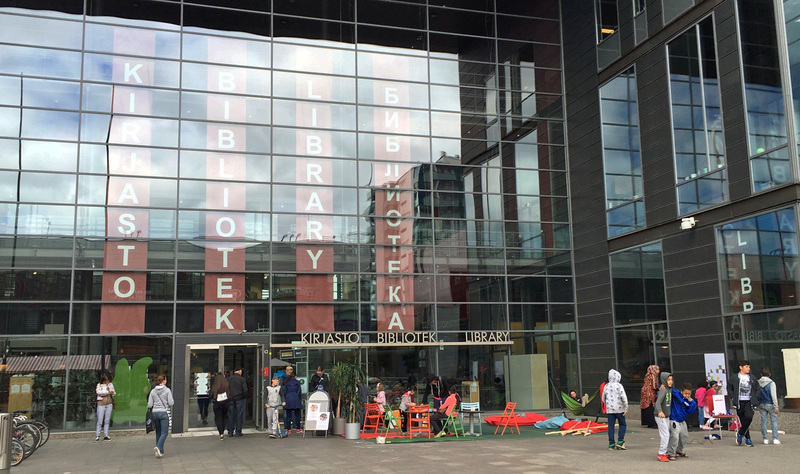 During the summer, you can play Mölkky (a Finnish outdoor game), and other outdoor games in front of the library. The sets can be borrowed from the youth department Pointti. Registeration for Celia: https://www.celia.fi/eng. You get help for this at the second floor info-desk. VHS-DVD converter is in the Makerspace. More information on helmet.fi/sello - Makerspace. Book online: https://varaamo.espoo.fi or call 09 816 57607. Choose Espoo_asiakas from the wireless network list and accept by clicking "Hyväksy". Galleria Anna is on the second floor of the library. Exhibitions also in a showcase, second floor. Please see the page Art exhibitions for more information. On the second floor. You cannot reserve the Open Group Study Room. You can talk and work with a group, or study. Lounge and stage. The large entrance lounge with a stage on the first floor can be reserved for events, fairs, competitions and shows. Wireless microphones. Chairs for 100 people available. More information on the page Facilities on helmet.fi/sello. There are 2 music rooms in the Music department that you can reserve. One of the rooms has a piano and the other one a baby grand piano and a harmonium. You may use the music rooms for 4 hours / week. There is also an electric piano you can play without booking. Online booking: https://varaamo.espoo.fi. For further information, please contact the Music department service desk or call 09 816 57607. Studio: Online booking: https://varaamo.espoo.fi. Available for customers of 15 years of age or over who own a Helmet -library card and have basic IT knowledge. Orientation is compulsory. Studio is primarily intended for recording music. For further information, contact: phone number 09 816 57607. Studio equipment: Logic Pro 9 / Logic Pro X, Universal Audio Apollo sound card, large and small acoustic diaphragm condenser, midi-keyboard, electronic drums, el. bass, el. guitar and electro acoustic guitar. Stage. The large entrance lounge and the stage on the first floor can be reserved for events, fairs, competitions and shows. Wireless microphones. Chairs for 100 people available. Enquiries: sellontilat@espoo.fi. Please see the page helmet.fi/sellospaces or the link for more information! There is fiction and and poetry in Cultural space but also an area with sofas and chairs on the second floor. Book Clubs, writer interviews, knitting clubs are held there. For more information, please see the Facilties-page.